Steep majestic cliffs, coloured sandy creeks, incredible bird life, unspoiled wild nature, natural hot spring pools in remote locations, the silence and the tranquility. It’s another Iceland. Exquisite tours that leave no one untouched. Enjoy an impressive diversity of natural wonders and unspoiled nature. The Westfjords is a region of small fishing villages, existing wherever they find land flat enough to survive. Patreksfjörður is the westernmost town of Europe and the second largest town of the Westfjords. Patreksfjörður has a great cultural and historical importance. It is the birthplace of many known Icelandic artists. The town has a long history of fishing and trade. It was a base of English, French and German fishermen, merchants and naval mariners in the early days. Despite the isolation, the nearby town of Bíldudalur is a lively place, with a high level of cultural life including the Sea Monster Museum, which demonstrates tales of sea monsters that played a colourful role in Icelandic folk culture for centuries. The ports of Patreksfjörður and Bíldudalur in the municipality of Vesturbyggð are both perfect starting points for trips to the most precious tourist attractions in the Westfjords. 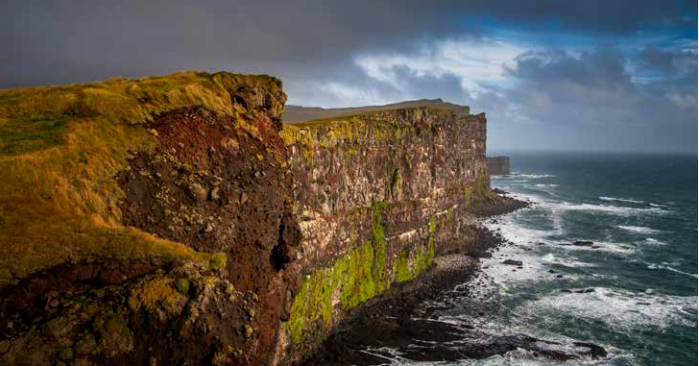 Walk on Europe’s largest bird cliff, the stunning Látrabjarg, the westernmost point of Europe. Látrabjarg is home to the largest seabird colony in the Northern Atlantic. Walking on the edge of the cliff and enjoying the majestic pristine Icelandic nature, is an unforgettable adventure. 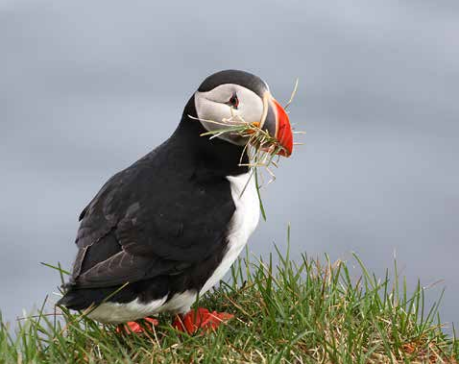 Látrabjarg is claimed to be the best place in the world to photograph puffins as they pose for the cameras. Rauðasandur (Red Sand) is Iceland’s most famous beach. It takes its name from the colour of the sand on the coast. Rauðasandur is one of Iceland’s most spectacular sights, confined by magnificent vistas on both sides; red colored sand in beautiful settings of black cliffs and blue ocean. An amazing seal colony is found on the beach, where grey seals and/or harbour seals are often seen at close range. In the summer, over 100 seals take advantage of the sun and sand at Rauðasandur, sunbathing and resting on the beach. Learn about these playful and curious animals. Because of their curiosity you can expect to get some excellent pictures of these beautiful animals in a picturesque setting. 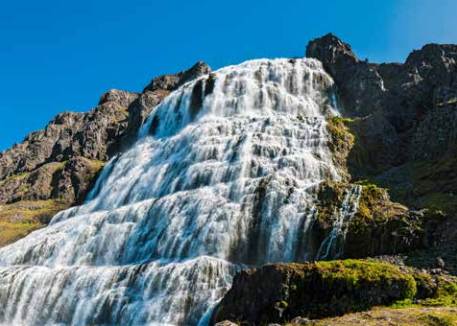 A short driving distance from the ports is the great waterfall Dynajandi, the largest waterfall in the Westfjords and one of the most beautiful in Iceland. It’s about 100 metres high and up to 60 metres wide. A hiking path leads up to the central gorge of the waterfall, allowing visitors to come close enough to touch the water as it tumbles down into the depths. The area is excellent for hiking and biking. For those who like trout fishing, trips and licenses for Lake Sauðlauksvatn are very modestly priced. Enjoy a sea angling tour in Patreksfjörður, bathe in a remote hot spring pool surrounded by beautiful Icelandic nature, or rent a bike to discover this area on your own. Enjoy the amazing bird life and incredible nature. It’s a wonderful place to fill your soul and camera with memories.